← News Articles 2011: Kiss to Team up with Hello Kitty? Japanese Street Styles seem to jump from one extreme to another; they are all dramatic and connote so many different messages for the wearers and the people viewing the wearers. Ganguro is the next style I’m going to introduce to you; I find this style one of the most extreme and quite contemporary compared to other styles like Loita, it’s much edgier and reminds me of some fashions from the late 90’s early 00’s which were available in the West. However like all Japanese Street Styles the characteristics are far more in your face. hair and neutral make up tones, the Ganguro look is at the opposite side of the spectrum with its use of brash colours and tanning. 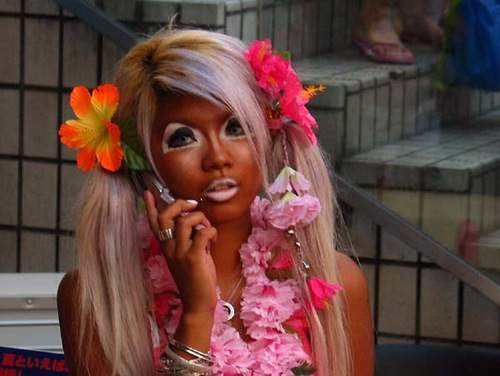 The overall Ganguro look is finished with facial gems, platform shoes and brightly coloured outfits, miniskirts and tied-dyed sarongs are very popular. Jewellery like Bracelets, rings and necklaces are worn to access. The look reminds me of 90’s girl bands such as Shampoo and the Spice Girls, I would say that this fashion style has been taken from elements of the West, but the elements are more exaggerated and in your face. That harsh, colourful image Ganguro girls present is a clear attempt at individuality and self expression, going against the traditional types of beauty seen in Japan and another example of how Fashion is used to demonstrate the wearer’s personal views against society’s norms. This entry was posted in Japanese Street Fashion and tagged 90's Girl Bands, Fashion, Ganguro, Ganguro Girls, Identity, Japanese Street Fashion, Japanese Street Style, Shampoo, Spice Girls, street fashion. Bookmark the permalink.